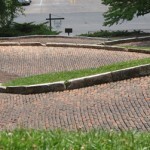 Snake Alley which consists of five half-curves and two quarter curves over a distance of 275 feet rises 58.3 feet from Washington to Columbia Streets in Burlington Iowa. Anyway, it’s still cool, and historic and here are some pictures. Crooked Yes… not the crookedest. It’s actually NOT the crookedest street – it just has the best marketing. The crookedest street in SF is Vermont Street. Researcher Jayms Ramirez measured the sinuosity (look it up – it’s basically a measure of crookedness) of both Lombard and Vermont streets, and proved that Vermont is indeed more crooked (with a sinuosity of 1.56 versus 1.2 for Lombard Street). I’ll send you a prize anyway.